When the hot weather seems to seep through the kitchen walls and spoils all desire to cook anything involving too much heat or effort, tartines are just the thing to munch on. 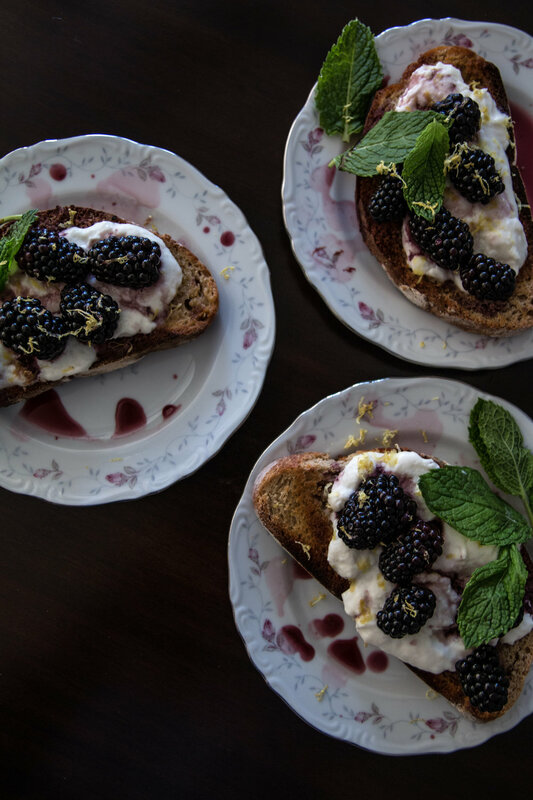 These are simple toasts topped with something delicious, savory or sweet, and this recipe has both: creamy burrata and plump blackberries drenched in port wine syrup. Each piece is topped with a few mint leaves and lemon zest to boot. Though fresh blackberries would be lovely if you prefer something more immediate, I recommend taking the time to marinate them in a bath of vintage port wine and a bit of sugar the night before serving. The blackberry juices and wine and sugar all intermingle to make some richly flavored berries and a sweet sauce for drizzling. I must add a little hint to try these berries on vanilla ice cream as well; it's a divine dessert! Burrata is a creamy cheese that tastes like mozzarella and spreads like ricotta. I think a slice of brie cheese, a smear of ricotta, or a few dollops of goat cheese would also be lovely on these tartines if you'd rather. Combine blackberries, port wine, and sugar in a sealable container, tossing to coat the berries evenly. Place in the refrigerator and allow to marinate overnight. The next day, assemble the tartines. Place the slices of bread into a toaster a pair at a time until all slices are toasted or place all the slices under the broiler on a sheet pan for a few minutes (be sure to watch the slices carefully so as to prevent scorching). Smear the salted butter on each side. Spread an even amount of burrata cheese on each slice. Remove the port marinated blackberries from the refrigerator, and spoon several on top of each slice, being sure to drizzle some of the port syrup on the bread as well. Top with mint leaves and lemon zest.